This is the start/end of the GSL trail. 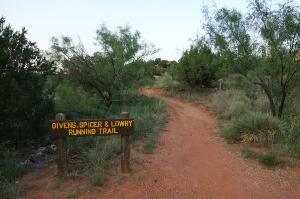 This log covers the Givens, Spicer & Lowry (GSL) Trail and the Fox Canyon Trail loop. These trails are multi-use trails and I encountered numerous mountain bikers and some runners while hiking the trail. Both trails are very well marked with distance markers placed every 0.1 mile. The GSL trail takes you past some beautiful rock formations and even provides a distant view of the Lighthouse rock formation. It exceeded my expectations. The Fox Canyon Trail is less scenic, in my opinion, is still a nice hike.